The master builders of antiquity have given us many remarkable works of architecture. The Pyramids, the Colosseum, the Taj Mahal and other ancient landmarks remind us of the great ingenuity of past civilizations. We are left to wonder: How were these immense projects constructed? Who built them? What were their techniques and technologies? For the most part, answers to these questions remain a mystery. Today’s Architecture, Engineering & Construction (AEC) trailblazers are likewise creating the landmarks of the future. Impressive structures, erected at lightning speed and using completely novel materials, are in the works all around the globe. But unlike the secrets of the past, we know exactly how these projects are able to produce such incredible outcomes. Their processes will soon become the standard procedures for the industry’s future. Frank Gehry and other avant-garde architects have pushed the envelope, designing unconventional structures that required new systems and processes for communicating and coordinating with fabricators, builders and owners. Such unique structures couldn’t have been built using traditional AEC means. Their techniques and technologies, adapted from manufacturing industries, offer a solution to the rampant waste and inefficiencies found in the AEC industry today. Through an integrated 3D model, all stakeholders clearly understand the alignment between design and engineering for the façade, Mechanical, electrical and plumbing (MEP) systems and overall structure. An online collaborative environment enables project stakeholders to reduce project risks, increase productivity and maintain design quality, through manufacturing precision and efficient delivery mechanism. Even unique building materials can be optimized and standardized to reduce costs. Prefabrication and offsite construction methods make onsite installation processes easier, safer and faster. Richard Kelly, Operations Director for buildingSMART International, shared his take on the Design for Manufacture & Assembly (DfMA) trend in AEC. The concept of DfMA was developed in the 1970s as a structured way of making product development more efficient. Today, however, DfMA is transforming the efficiency with which buildings are brought to market and is gaining greater acceptance as new technology allows for improved communication among AEC practitioners. When applying this concept to the AEC industry, DfMA is about taking a holistic view of a building to determine the best way of making it. Its goal is the efficient production of a high-quality, cost-effective facility that, despite the mass production of certain processes, still provides the variety the client desires. More predictable installation. A DfMA approach looks to eliminate components, because more parts means greater potential for assembly problems. It also requires tolerances among various trades to be agreed upon in the early design stage. Therefore, when components arrive at the job site, they all interface correctly. Higher quality components. Because much of the project assembly is done in a clean factory environment, the end product can be of higher quality than what is produced onsite. Also, there is opportunity for better quality materials which, as a piece part might be more expensive, but costs are saved overall through less construction time and reduced lifetime maintenance. Improved worksite safety. This prefabrication focus means that fewer trades are required onsite, the site aspects are better illustrated and the workspace is more predictable, which leads to improvements in both safety and logistics. When design and construction teams centralize on a single, cloud-based, integrated data model, they overcome cultural and geographical boundaries, and unleash the power of cross-disciplinary collaboration. Simulations enables builders to optimize sequences and flag issues before construction even begins. What used to be considered design risks are now engineered and tested in a virtual world, before they are implemented in the real world. Even the smallest firm can make a big impact on project outcomes. 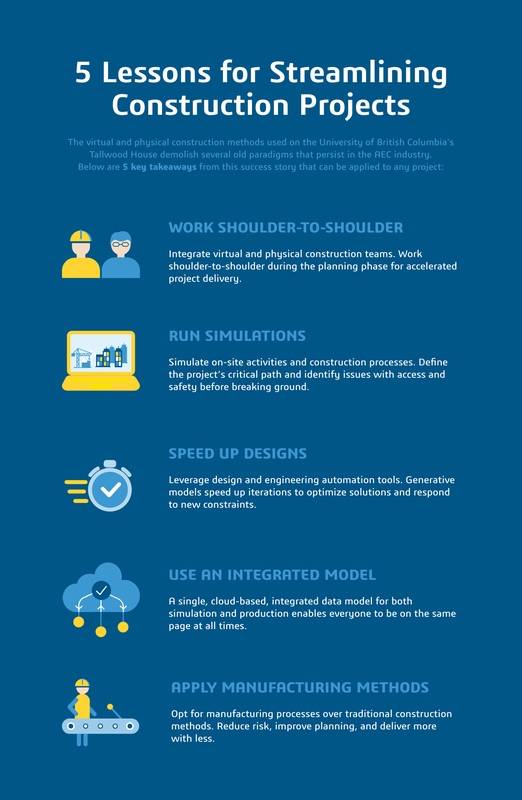 All this is possible today with the 3DEXPERIENCE® platform. "An integrated, cloud-based data model is a tool for seamless AEC supply chain collaboration." The University of British Columbia’s residence hall known as Brock Commons Tallwood House demolishes the old paradigm that high-rise buildings must be made of steel and concrete, and constructed onsite. At 18 stories high, Tallwood House features the first North American use of mass-timber products in a residential high-rise. The building’s pioneering use of Virtual Design and Construction (VDC) modeling and onsite assembly of manufactured parts helped complete Tallwood House approximately 70% faster and at less cost than traditional concrete buildings of the same size. On the Brock Commons Tallwood House project, CadMakers served as a virtual general contractor, working closely with all stakeholders. Using the 3DEXPERIENCE platform on the cloud, CadMakers created a 3D structural model and manufacturing simulations for Tallwood House that supported pioneering innovations in building materials, design collaboration and construction processes. Through the use of prefabricated materials, collaborative processes and advance problem-solving, Tallwood House met an ambitious 9.5-week construction schedule of approximately two floors per week, and roughly three months ahead of schedule. Because it was the first building of its kind, Glatt believes the time and cost savings will magnify in subsequent projects as the industry gains experience with this new way of doing things. The implications are far-reaching: less waste, faster completion and greater environmental sustainability. The ordinary can now be extraordinary. What was once for the few can now be for the many. But how? By refusing to accept the industry’s past as its present. By turning an old accepted industry formula on its head and daring to create a new one. By adopting digitization and leveraging a unified platform. By working with even greater precision, control and speed. By enhancing our ability to anticipate construction project results, to adapt processes to any unanticipated project event and to maximize project outcomes. By embracing the powerful combination of 3D modelling, design automation and manufacturing methods. With these techniques we can now improve quality, expand scope, and decrease time and cost. We can see how the addition of a single brick will affect every aspect of the job. We can take design risks without the risk, because we can test in the virtual world. We can explore the use of new materials and flag issues before construction has even begun. We can collaborate despite cultural and geographical barriers.